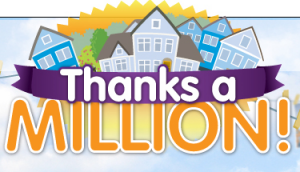 As part of the @Quickloans Thanks a Million celebration you can win prizes like Target, Amazon, Lowe’s and Starbucks gift cards, Fatheads, Xeko toys, free credit monitoring and more! Entry Dates: Begins on August 1, 2010 and ends on December 31, 2010 at 11:59 p.m. ET. Play on the Quicken Loans Facebook Brand Page: Between September 4, 2010 and December 31, 2010, you can play the Instant Win Game application on the Sweepstakes tab on the Quicken Loans Facebook brand page www.facebook.com/QuickenLoans. Entry Limit: Each participant may play one (1) time per day during the Promotion Period, regardless of the method of entry. (10) GRAND PRIZES: System and one (1) year of free monitoring from Protect America. ARV: $360. (15) FIRST PRIZES: A $100 Fathead gift card. ARV: $100. (3,000) SECOND PRIZES: One year of Once/Month PostEGrams. ARV: $12. (550) THIRD PRIZES: $10 Target gift code. ARV: $10. (550) FOURTH PRIZES: $10 Lowe’s gift code. ARV: $10. (550) FIFTH PRIZES: $10 Amazon.com gift code. ARV: $10. (2,580) SIXTH PRIZES: $5 Starbucks gift card. ARV: $5. (2,000) SEVENTH PRIZES: Trading Card Starter Kit from Xeko. ARV: $5. (25,000) EIGHTH PRIZES: One Year of Monitoring from Quizzle. ARV: $4. (23,000) NINTH PRIZES: Animal Plush from Xeko. ARV: $2. On my first time playing I won a year of credit monitoring! Got a stuffed animal…hey it’s something! I just won a xeko plush. I guess I have to wait to receive it in the mail since they didn’t tell me how to claim it. I won a stuffed animal from Xeko!!! thank you!!! I won the 1 Year PostEgram and my husband won a Xeko plush.. haven’t received it yet but the PostEgram was mailed quickly. I won a plush toy today! I never win anything so I am excited. Going to donate it to Toys for Tots. I just won a $10 Amazon gift card!! Thank You. I won a Animal Plush from Xeko! so excited. My son will love this! Just won One Free Year of Credit Monitoring!! Just won a Xeko plush animal. Can’t wait to get it. ANY CLUE AS WHAT IS THE CATCH FOR WINNING THE PLUSH?? My Xeko came with a free (month?) to the online game. I didn’t do anything with that, but to me there was no catch. Does that mean we can win more than one instant win prize?? Liane – I just received the same e-mail. I checked the rules again for the IWG and it states one IW prize per person. So confusing. I am a little slow, i won the plush animal on the first day of the sweepstakes!